Hey there faithful readers, here's your chance to win yet another free pair of passes to see a movie before it officially hits theaters, courtesy of our friends at Allied. 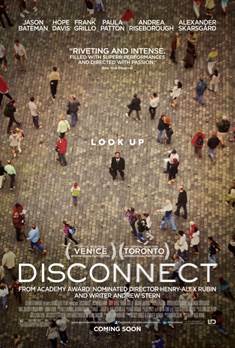 DISCONNECT is having an advance screening on Monday, April 22nd at Valley View at 7:30pm. You'll need to go to www.gofobo.com/rsvp and enter this code: CMBGAR1. The drawing for winners will be held on April 15th, so be sure to get your code entered before then. DISCONNECT explores the consequences of modern technology and how it affects and defines our daily relationships. Shot with eavesdropped naturalism, it marks the first fiction feature from Henry-Alex Rubin, director of the Oscar-nominated MURDERBALL. Disconnect is produced by Mickey Liddell and Jennifer Monroe of LD Entertainment and William Horberg of Wonderful Films from an original screenplay by Andrew Stern. The ensemble cast includes Jason Bateman (Identity Thief, The Change-Up, Up in the Air), Hope Davis (Real Steel, Mildred Pierce), Frank Grillo (Captain America: The Winter Soldier, Gangster Squad, The Grey), Paula Patton (Precious, Mission Impossible-Ghost Protocol), Michael Nyqvist (The Girl with the Dragon Tattoo), Andrea Riseborough (Brighton Rock, W. E.), Alexander Skarsgård (True Blood, Melancholia) and Max Thieriot (Jumper), as well as Jonah Bobo (Crazy, Stupid, Love), Colin Ford (We Bought A Zoo) and Haley Ramm (X-Men).